Blue Heron eating my fish! 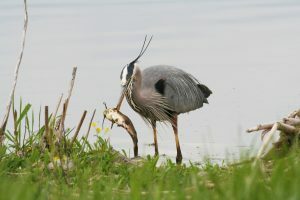 I’m hoping you have something to keep away a great blue heron that’s eating my catfish! My pond is about 80 feet long and 30-40 feet wide. I’ve been raising catfish, bass, bream and some koi and for the most part, they’ve been fine. Every know and then we get an otter or raccoon that tries to catch them but the pond is big so its hard. But there are a few herons that are doing damage. I can’t shoot them but I’d like to get rid of them. Suggestions? We have a SOUND REPELLER that will do the job. It sends out ultra sound by default and if you ran it continuously, one unit will be able to protect the whole pond. 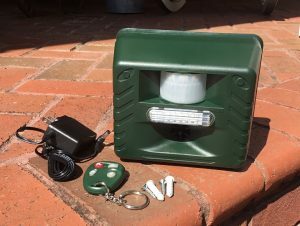 But if you wanted, you could power it by batteries and rely on the motion detector to turn it on when the heron comes around. The motion detector will sense the heron from 40-50 feet away and when it does, it will sound off. By default, the ultra sound it sends out will be enough to chase away herons but when using the motion detector, we also recommend you turn up the audible sound too. The range of the loudness for the audible sound is 0-100 DB so a good 40-60 DB would be strong enough to give the heron a big scare. In most cases, one encounter with the unit will keep the heron away for good. These units also have a remote on/off control switch so you can power it off when you want to get in its range. The power consumption is light, maybe $.25 a month, and 4 “C” cell batteries should keep it going for 3-6 months. Lastly, it will keep away a range of animals that might like to eat you fish like otter, raccoon, mink and more.Units should be placed 1-2 feet above ground and pointed in the direction where animals are entering as well as “over” the turf you want to protect.